Carolina Panthers guard Taylor Hearn was in Augusta, Georgia — less than an hour away from his home of Williston, South Carolina — when his offseason quickly soured. The 6-foot-4, 315-pound offensive lineman was at a bar on Thursday night when he got into a fight that spilled into the street. Despite his apparent size advantage, Hearn was knocked out, and it was all caught on camera and released by TMZ. According to the report, police arrived at the scene shortly thereafter, but no arrests were made. Hearn had just completed his rookie season with the Panthers after signing with them as an undrafted free agent last April out of Clemson. He spent most of the season on the practice squad but appeared in the team’s final four games when injuries decimated its depth. This certainly is a tough look for Hearn, who could have competed for a starting role this season. 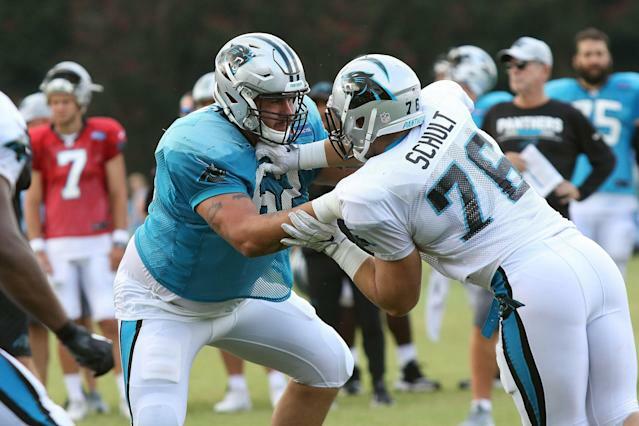 Despite retaining All-Pro right tackle Daryl Williams and signing center Matt Paradis, along with cutting left tackle Matt Kalil, the Panthers are still looking to upgrade their line. They even apparently are looking at 34-year-old lineman Jermon Bushrod. For what it’s worth, the league did not punish Dallas Cowboys running back Ezekiel Elliot for his involvement in a 2017 bar fight, although police halted the investigation citing a lack of witnesses.